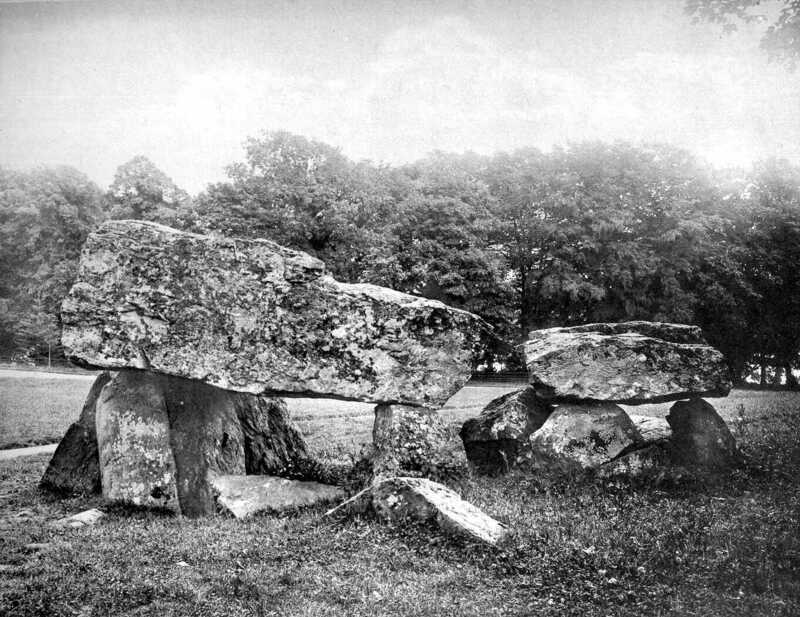 These two Cromlechs are situated in the woods of Plas Newydd (formerly called Llwyn-y-moel); they are close to the stables, and are about one mile and a half from Llanfair P.G. station. The capstone of the largest measures twelve feet seven inches long by ten feet eleven inches in width, and four feet in depth. It is supported on the northern end by four upright stones, and on the southern end by two, averaging from three and a half feet to five feet in height, and it has also two supports fallen down, one on each side. The other Cromlech lies close behind the one above mentioned. The capstone is nearly square in form, and is about five feet six inches each way, and two feet three inches in depth. It is supported at present on three uprights; three having fallen down, one lying between the Cromlechs, and one on each side.